So while I removed the lights from the tree I thought of both of those fine ladies and smiled the entire time until the chore was done and now the two cats are sleeping close to the tree that they helped with, a-huh and I sit and enjoy a bowl Albondigas Soup. An easy enough dish if you plan ahead and package up ground pork and your favorite tender cuts of beef or veal. Simply thaw, season and roll into meatballs, or prepare the meatballs, sauté, package and freeze for a quick bowl of soup any night. I doubled the Fine Cooking meatball mix and adapted the seasonings to my taste adding more smoked paprika (not hot) garlic and thyme. 1. Gently mix the veal and pork with the minced garlic, 1 tsp. of the thyme, 1/4 tsp. paprika, 1 tsp. salt, and 1/2 tsp. black pepper in a large bowl. Add the manchego, egg, and panic, and gently mix until the meat absorbs the breadcrumbs. Gently roll 1+1/2-oz. portions of the meat into balls; you should get about 20. 2. Heat 1-1/2 Tbs. of the oil in a 5-to 6-quart heavy-duty pot over medium-high heat until shimmering hot. Add half of the meatballs, reduce the heat to medium, and cook, undisturbed, until browned on the bottom, 1 to 2 minutes. Flip and brown the other side, 1 to 2 minutes more. 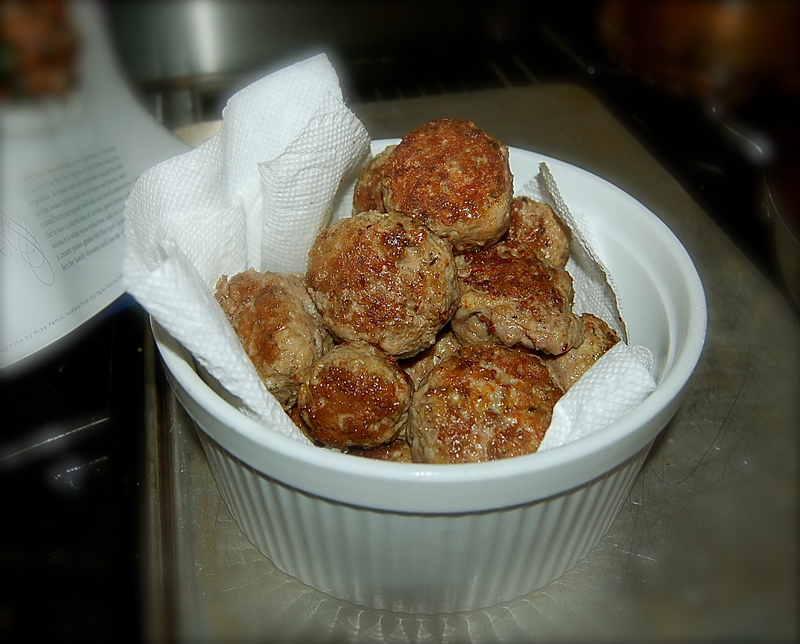 Transfer to a paper-towel-lined plate, and repeat with the remaining meatballs. 3. Pour off all of the fat. Add the remaining 1/2 Tbs. oil and the sliced garlic to the pot. Return the pot to medium heat and cook until the garlic sizzles, about 1 minute. Add the remaining 1 tsp. thyme, 1/8 tsp. paprika, and the saffron; cook, stirring, for 15 seconds. Add the chicken broth and crushed tomatoes, and bring to a simmer. Return the meatballs to the pot, reduce the heat to medium low, cover, and simmer until the meatballs cook through (160°F), about 25 minutes. Season the broth with salt and pepper to taste. 4. Meanwhile, bring a medium pot of well-salted water to a boil. Add the pasta and cook, stirring, until tender, about 4 minutes. Drain well, return to the pot, and toss with 1/2 cup of the broth. To serve, mound the pasta in shallow bowls. 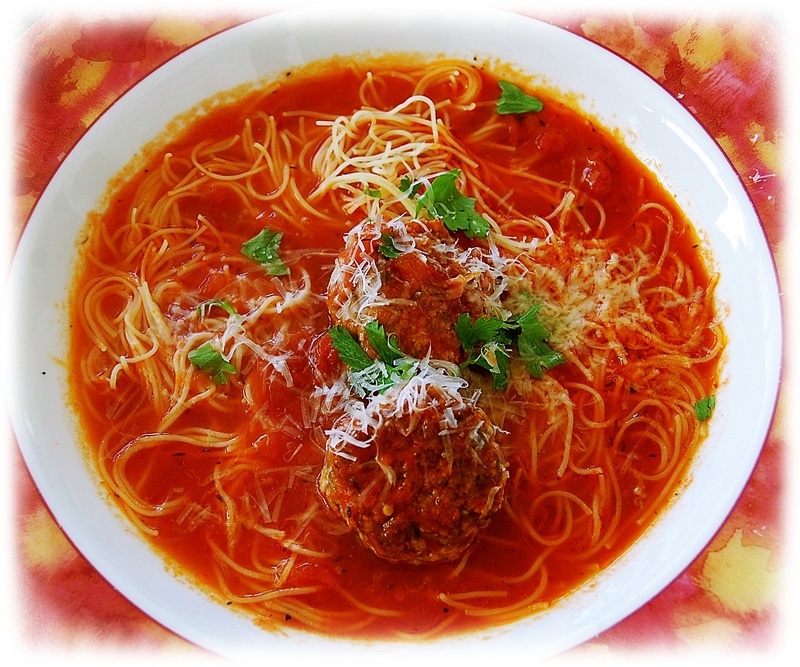 Top with the meatballs and broth, sprinkle with the parsley, remaining thyme, and serve with extra grated cheese. *The ground pork and tenderloin didn’t have a ton of fat so there wasn’t much fat in the pan, just enough to sauté garlic and spices. A splash of Rioja red wine to deglaze the pan didn’t hurt at all.